This entry is written by a guest blogger; Yvonne’s mother, Betty. The family suggested that mormor meet them on Aunt Marianne and Onkel Børge’s farm “Gyldenlund”, in Denmark. Douglases and Betty Leicht flew together to Reykjavik from Copenhagen. 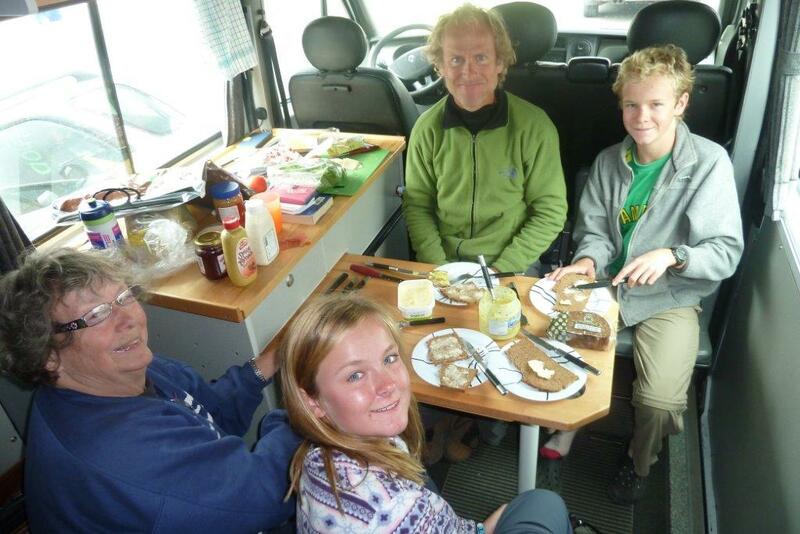 They picked up a camping van that could sleep 6 and successfully slept 5. It was a test for mormor, but Jake and Kaia found it a luxury not to pitch the tent nightly. Good protection from wind and cold. Duvets were provided. Betty writes: I met an Icelander in Maryland, USA, in March, Steinn Steinsson. He provided good advice to our questions and he could keep some of our baggage (i.e. tent, bicycle trailer, and camping equipment) while we drove around in the camper with a minimum. And he lent us a folding table and a couple of chairs. 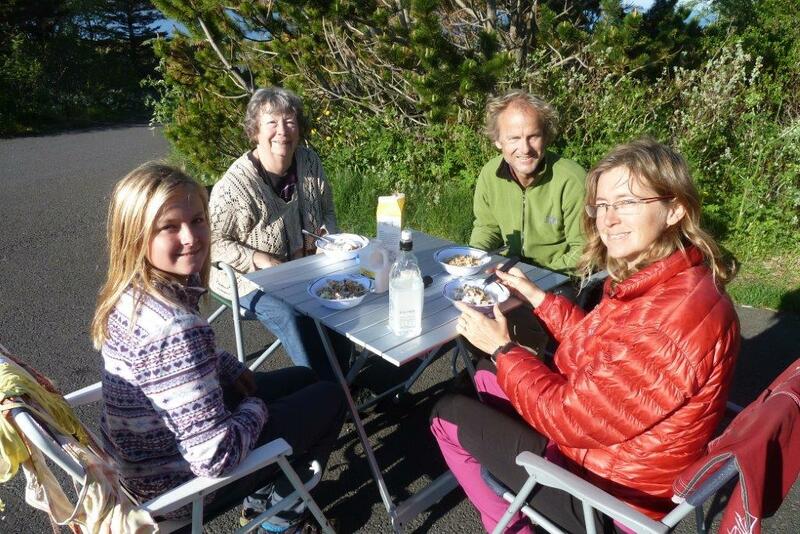 When we left “stuff” at his house, and a week later picked it up, they had baked bread for us and fed us Icelandic–one example is dried “hard fish” eaten like potato chips with butter. Thank you, Steinn and family. Cam did all the driving. He and Yvonne took turns making meals with food purchased in grocery stores. With some imported food, much in Iceland is local—dairy products, vegetables grown in geothermal greenhouses, meat, fish, bakery goods. 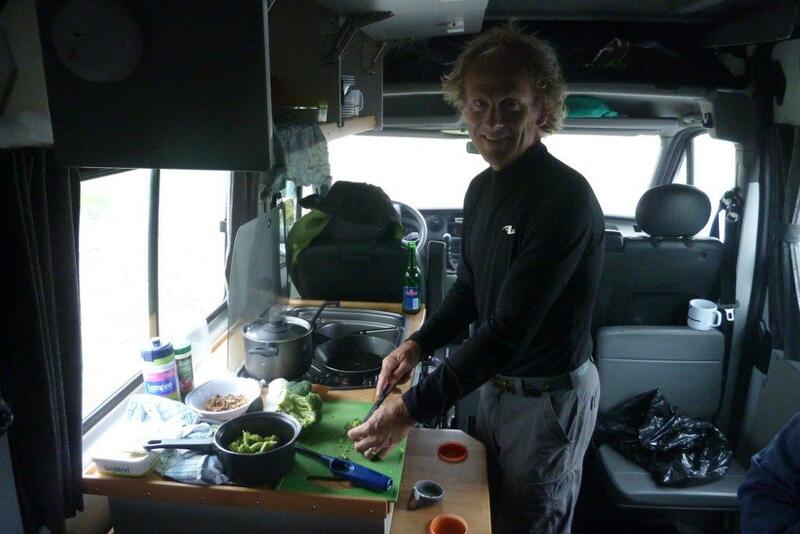 We had most meals in the camper, but ate outside when possible. Too cold to eat outside, but a cosy meal. Gathering energy for a full day. White Nights kept us up late and we slept until 8:30 or 9 am. The beds were comfortable. I fell asleep quickly every night. I am an ‘up once in the night’ lady. I practiced holding my bladder and became good at it. I would wait until another person stirred because I needed help getting out and in and sliding the door closed (needed to be slammed). Climbing into the van and also out was a strain on my right knee and the rest of me! 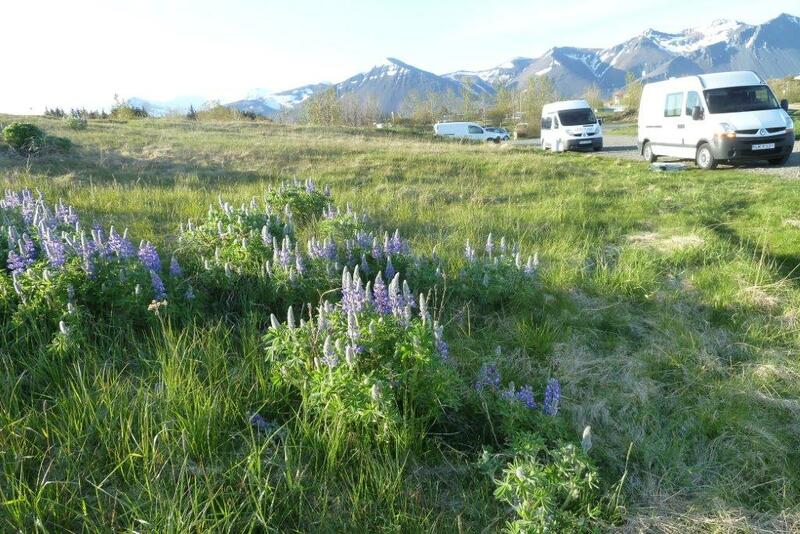 I had heard that Iceland took a major decision a few years ago to import Alaskan Lupine. 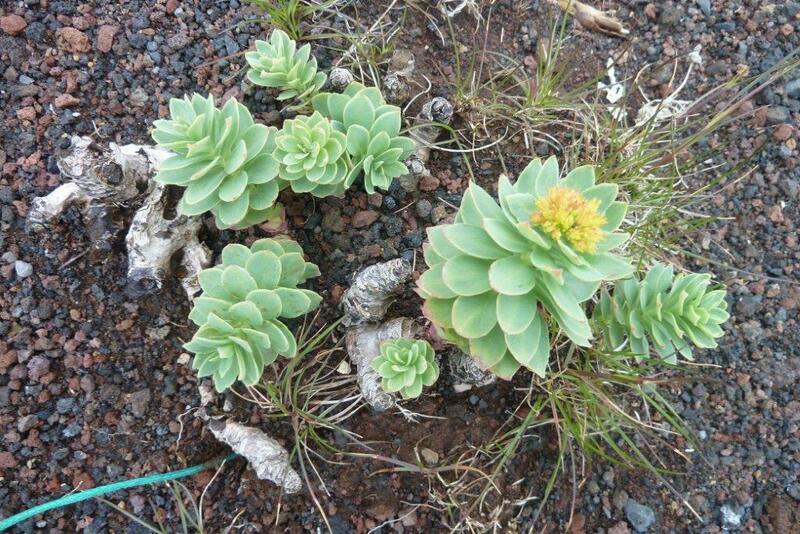 It adapts well to the climate and soil. 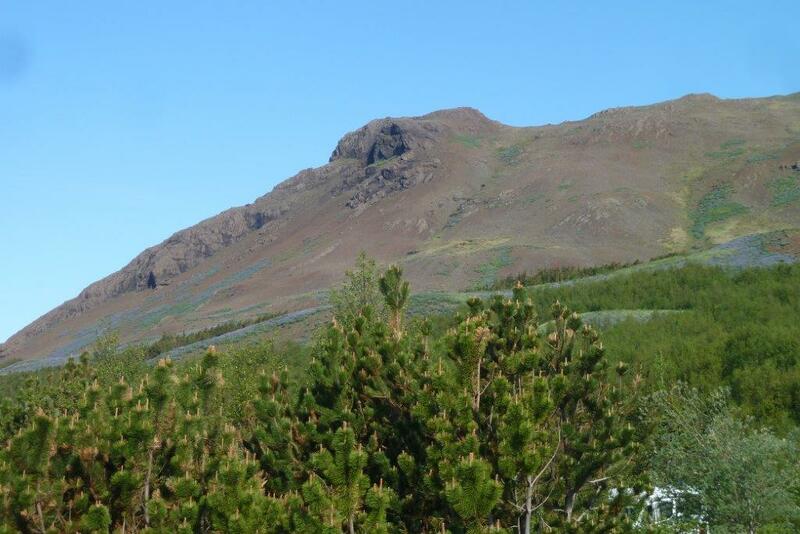 We did occasionally see wild countryside with steep slopes of the tall blue flowers. Lupine blooms for a long season. This is our first campsite — the only time we paid to stay at an official camping ground. You can see lupine is spreading up these steep, barren slopes. I also photographed the intriguing and charming local flowers. In the pictures they look big, but most flowers are smaller than your little fingernail. They rush to bloom in the cold, bright days of spring. 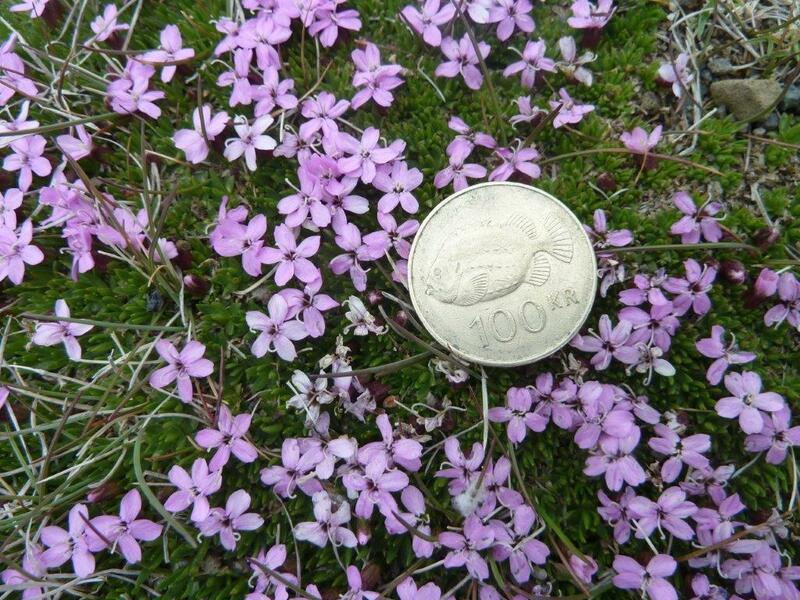 Tiny wildflower called “Lambagras” or Moss Campion. The birds are nesting. First thing in the morning and late in the evening, we were charmed by the varied bird chorus. 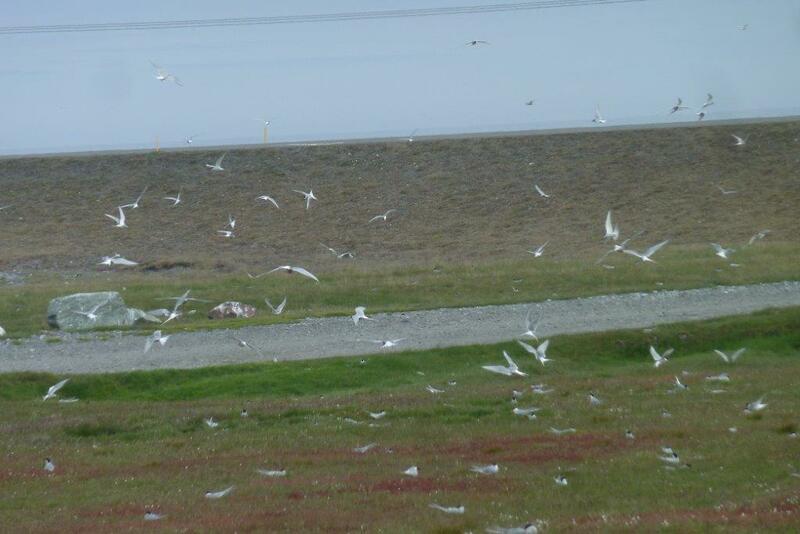 Because there are few ground predators, a tern nests on the ground. We saw many as we parked near a glacier lake with icebergs. Tourist busses drove a circle around the nesting meadow. The birds were used to the traffic, but not the curious tourists who wanted many and closer pictures. The protective male swooped and warned the humans to pull back. We saw a tern draw blood on an onlookers head. We drove through dramatic, spectacular countryside. We saw black beaches, ocean views, and sheep with lambs on uneven terrain. We could spot the mother ewe and her lamb (one or two). The sheep spread out in the large fenced areas. Tiny lambs followed the mothers. But my surprising observation was that lambs did not nestle close to Mom. They lay down facing her and she settled some metres away. I wished them warmth, but instead independence was an early lesson. Horses had foaled. 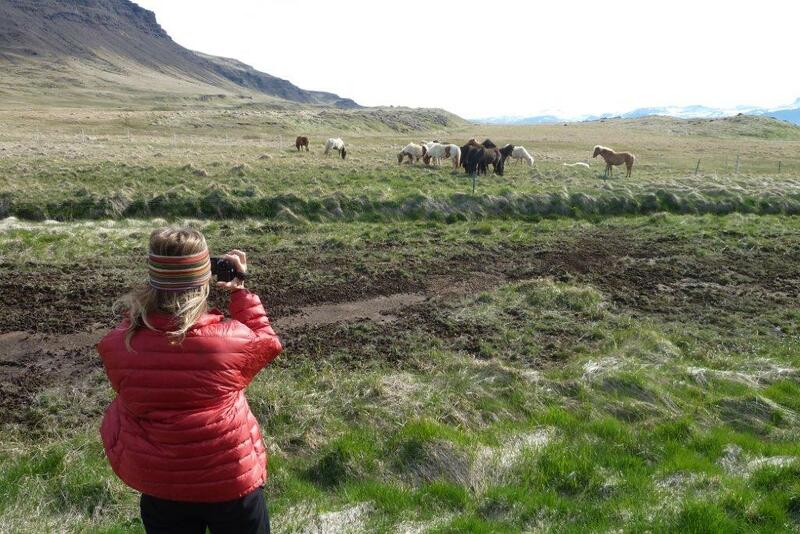 All are “Icelandic Horses”; varied colouring, sturdy stature, elegant long manes and tails. No other horse is allowed in the country and if a horse is taken out for international competition or to be sold or bred, it cannot ever return to Iceland. Icelandic horses at home in their rugged terrain. We explored phenomena of Iceland. The camper gave us freedom and possibilities. We were frequently calling out “foss” whenever we saw a waterfall. Gullfoss is the greatest and part of the Golden Circle which includes the original geyser and the earliest parliament “Thingvellir” the place for annual meetings and rule-making gatherings through the centuries. Another blogger will tell of the tectonic plates at that place. I did a double-take when I saw this big-eyed troll coming out of the ground! Steam seen often was evidence of geothermal vents and action. 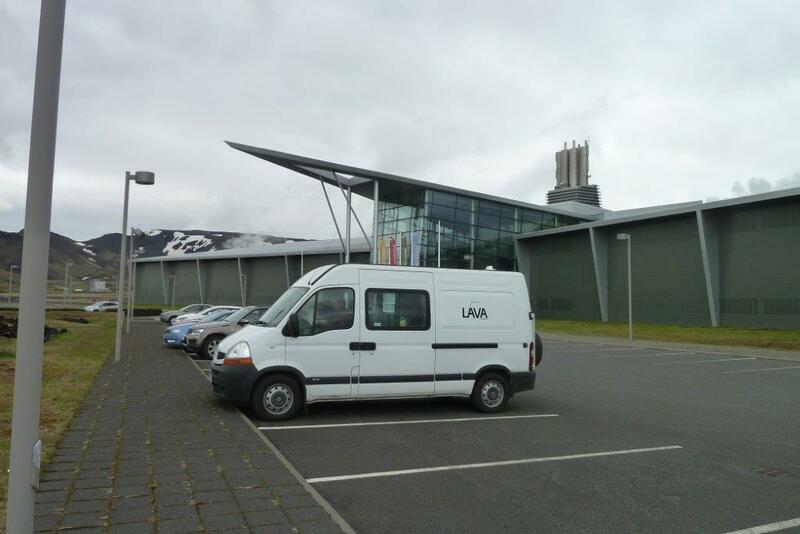 The plant, making electricity from natural hot water steam, is where I got my best picture of our van called Lava. This photo, taken at the plant that produces geothermal electricity, is the best one of our camper called “Lava”. A unique institution in Iceland is their geothermal warm swimming pools. The temperatures are kept the same summer and winter. Even small towns have pools. Pools and hot tubs are marked with the Celsius degrees of the water. Every Icelander knows how to bathe before swimming, and the rules are clearly explained. We campers appreciated the two to three hours we cleaned up, soaked and played–four different times. The slides and tunnels added fun. The most imaginative was a long slide with tunnel that dropped the person onto a trampoline slide and then into the water. We took a ferry to the Westman Island of Heimaey. Bringing the camper meant we had our lodging, kitchen, and dining room. We drove from the port through town and up, up. It was very windy and cold. It was also late. We learned the next day about the volcanic eruption of Eldfell in 1973. 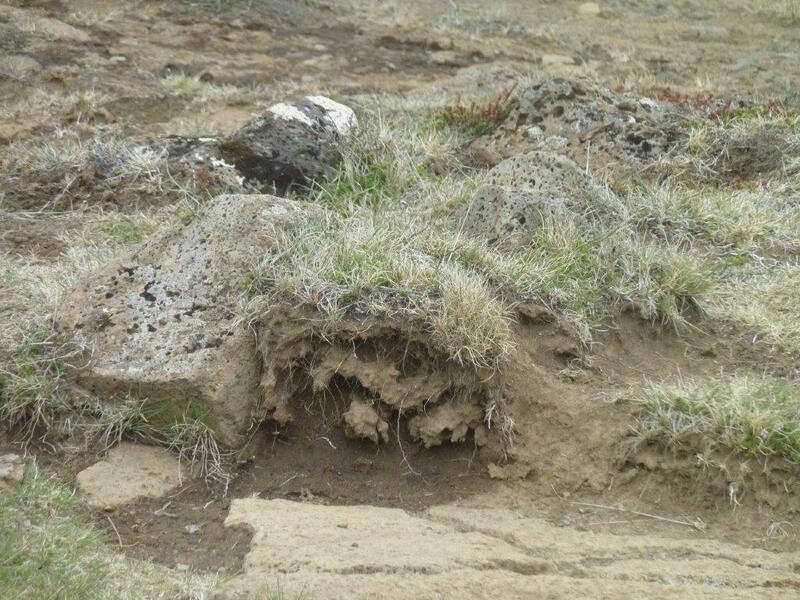 We actually had slept on the lava flow (no vegetation) near the source of the eruption. The Volcano Museum told us much and showed a house that had been excavated for the museum. The island’s population had been successfully evacuated to the mainland as the eruption continued many months. Our last night June 20 was Kaia, Jake, Cam, and Yvonne’s chance to celebrate the Summer solstice by walking up a mountain in never-ending twilight . They were “home” again at 2 in the morning and slept–starting our longest day which would end in Canada.